It's already starting...Elmo Love. 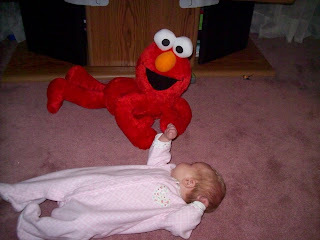 As with all of my boys, my daughter is now falling in love with Elmo. What is it about Elmo that makes kids go ga-ga? I'm not sure, but I certainly am thankful when my 16 month old is having a hard day and I can put on Elmo's World and cheer him up instantly. Or when my husband and I can use Elmo as a punishment; "Eat you dinner or no Elmo show!" Thank you Elmo! This picture is from December 29, 2007, our daughter's Baptism Day. After her Baptism (at which four priests were present! ), Fr. 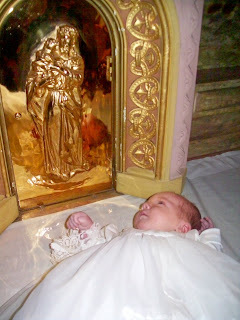 Landry consecrated her to Mary, and she was placed on this altar below a statue of Mary. It was beautiful! After seeing this picture, I realized Maggie is looking right at Jesus on the Tabernacle, isn't it amazing how babies can know and love God at such a tender age?? Today was a snow day, which more importantly meant that today was a "wake up to the phone ringing at 5 am to say that the boys had no school, followed by another phone call at 5:30 am saying that my husband had no school (he's a teacher), which led to my calling in to work saying I couldn't make it in, and after breakfast led to a whole lot of playing outside in the snow" kind of day. 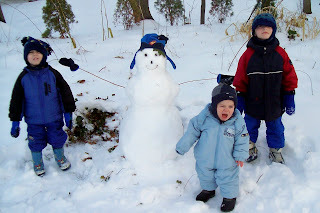 As you can see from this picture, Eamon is not one for cold weather...or maybe he's just mad that the snowman stole his mittens! After weeks of reading many Catholic moms' blogs, I have decided to try it out for myself. Even if nobody is interested in the trivial things I have to say, at least I'll be creating memories to look back on as a family. Please God, help my little ones grow up to even want to remember all these stories!! !